Fridge0 Refrigeration offers same day service throughout Melbourne's Eastern and South Eastern suburbs, from Kew to the Peninsula. 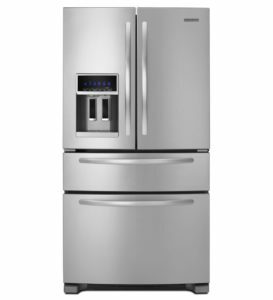 We repair and service all makes of Samsung fridges. Modern Samsung refrigerators have become a main player in the market of white goods due to their stylish designs and modern engineered concepts. Samsung has designed a twin cooling concept which they have applied to 90% of their product line. All of their French door and side by side refrigerators - with or without water and ice - have this design. This design does lead itself to more problems than otherwise necessary. Twin cooling pretty much stands for “double the components” involved in the correct operation of a Samsung refrigerator. It is like having 2 separate units (fridge/freezer) stuck together. Most common issues with this design is the actual insulation evap cover which sits over the cooling coil in both the fridge and freezer. Most commonly, the insulation evaporator cover in the refrigerator is the one that fails or wears out over the course of 2 to 6 years depending on the amount of use ie frequent opening and leaving the fridge door open. This process lets air into the fridge, the air holds moisture which then transfers onto the cooling coil as ice. When the refrigerator goes through its defrost cycle and melts the ice some of that water, instead of draining away, gets absorbed by the insulation evaporator cover which is made out of polystyrene. This will eventually become water logged and turn to ice which then creates a number of issues most common being: blocking the main fridge fan that regulates a constant air temperature all throughout the refrigerator and therefore the fridge temperature starts being irregular. The process of removing the insulation evap cover while it is frozen over is difficult and time consuming and can prove fatal to the fridge itself if attempted by someone who is inexperienced. Generally when a Samsung fridge starts tripping the safety switch on your main household switch board it may be one of the 2 to 4 heaters built into the unit itself that have failed. These have to be checked and measured to see if they are faulty or not. If one of the heaters is found to be faulty then they can be replaced onsite and there is no need to take the fridge away to the workshop. The second most common thing to go is the compressor itself (also called the motor or pump). This is the heart of the refrigerator because it pumps the refrigerant around the system which creates the cooling effect. If it turns out that this is the reason why your refrigerator is tripping the safety switch then the compressor needs to be replaced and in order for that to be done properly the whole unit/refrigerator needs to be taken away to the workshop for repairs and if necessary a loan fridge will be provided . When the refrigerator or freezer is making all the right noises but just isn’t cooling, it may be because the unit has developed a gas leak or refrigerant leak, which is quite a involved issue and isn’t simply fixed by adding refrigerant which seems to be a common belief. First, the leak needs to be located. Once it is located, it can be sealed by welding or brazing before re-gassing the unit. This whole process is quite involved and needs to be performed in a workshop and not on site. Just like with all refrigerators, the most common electrical issues that arise can be resolved onsite without having to take the refrigerator away to the workshop for repairs. Any refrigerator with system issues like gas leak compressor or system blockage need to be taken away to the workshop because welding needs to be performed and the system needs to be cut open. Both these operation can be and are messy. Once works have been completed, the refrigerator has to be tested for correct operation for at least 24 hours.